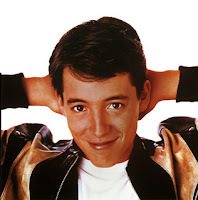 Love this: Ferris Bueller's Twitter account. He's not the only cool dude from the movie who's in with the new media. That movie, for me, was one of the few films that is just about as close to perfect as it can get. Truly inspired, Mister Hughes. We will always miss you. Were you a Ferris fan? Share your favorite line or scene in the comments. I have seen this movie over 200 times. I can quote it verbatim! - BTW Matthew Broderick was supposed to marry me. Not sure why that didn't work out.